The main objective that APlus Group has with our customers is that they can benefit from the best prices in air conditioning and air conditioning equipment, but at the same time, that they have the best air conditioning and air conditioning installers in terms of installation, maintenance and repair. We are a company dedicated to Split, multi Split and ducted air conditioning installations and pre-installations. Our specialized officers, with more than 10 years of experience in the sector, guarantee the correct conditions and finishes of any air conditioning installation. We work with the main suppliers and brands in the air conditioning sector to offer our customers the guarantee and security that they request. We have a wide range of air conditioners of different types such as wall split, ducts, cassette split, floor-ceiling split, or air curtains for domestic use, both in new works and in home renovations, for small establishments and offices. 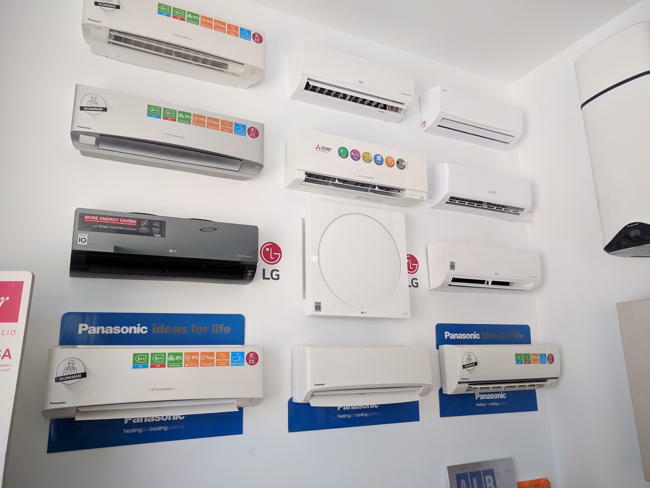 All our air conditioning units are equipped with the latest technology and guarantee from the best brands such as MITSUBISHI, PANASONIC, DAIKIN, LG, FUJITSU. We carry out all types of air conditioning and split or multi split installations in Elche, Alicante and the surrounding area. In addition, we carry out installations for commercial establishments, obtaining 360º solutions in air conditioning. You can consult our air conditioning catalogue for 2018 in our section. Split air conditioners are mainly characterized by being designed to adjust the temperature of homes or small businesses. Split air conditioning installations are the most common today. They are the cheapest and most effective systems for air conditioning in the home. In the APlus group we have one of the most extensive catalogues on the market, with an endless number of models of all types of ranges and applications that adapt to rooms of different sizes, having a good acceptance in both the domestic and small business environment. Most of our air conditioning models incorporate Inverter technology. The Inverter units air-condition the rooms gradually and once the temperature has been reached, it remains stable without oscillations, which means lower consumption and greater comfort. This type of installation consists of an indoor unit and an outdoor unit, so its installation is really simple and its price is very economical. When we refer to a 1×1 Split, we are talking about the interior air conditioning unit. Depending on the model you choose, the device will have different functions and features (humidifier, air filter, operating modes, WiFi control). These devices require an outdoor unit that implements the compressor, in charge of carrying out the cooling or heating process according to our needs. Split 1×1 wall air conditioners are the most widely used in homes, offices and small businesses, but there are also floor split models, where we also have an extensive catalogue and our consultants can help you choose your equipment, whether it is for the wall or for the floor. Multi Split air-conditioning units are mainly characterised by the fact that they can air-condition different rooms using a single outdoor unit. This type of installation is ideal for homes with many rooms and for businesses (offices, commercial premises, etc.) where a 1×1 split is not enough to cool or heat the entire surface. Multi Split air conditioning units are made up of up to 5 splits in the same unit, which allows us to cool or heat many more meters in a shorter time, achieving a reduction in consumption and a saving in the bill. The Multi Splits consist of an outdoor unit and several indoor units. This type of equipment includes a valve for each interior equipment, which allows us to make individual use of each equipment and control the temperature in each room. The advantages of using Multi Split devices, in addition to the energy savings, are the space savings, as each Split does not require an outdoor unit. In APlus Group we have a wide variety of air conditioning brands (Fujitsu, LG, Daikin, Mitsubishi,,,,) that offer Multi Split equipment. On the other hand, one of the biggest disadvantages of this type of installation is that if the compressor (outdoor unit) is not damaged, we are left without any device that can air-condition our home or business. Ducted air conditioning or centralised air conditioning is one of the best options when it comes to carrying out the integral air conditioning of your home, commercial premises or offices. The ducted air conditioning system operates through a central system that distributes the air throughout all the rooms of the house. The ducts are installed in the ceiling, hidden from view, and only a few grilles are visible, through which the cold and hot air comes out. This system consists of 2 units, an interior unit, which is usually installed on the ceiling of the toilet or bath, and an exterior unit. Airzone systems are available for managing the temperature of rooms in the home or business. These systems allow the temperature of each room to be controlled independently through a thermostat, achieving savings in energy consumption. In APlus Group we have the main brands for the installation of ducted air conditioning equipment, from models for small spaces to models suitable for large surfaces. The models for air-conditioning your home or business are measured in frigories. The more space there is to air-condition, the more cooling will be required. Our advisors will guide you in the choice of your ducted air conditioning equipment, to avoid unnecessary expense both in the purchase of the equipment and in energy consumption. We carry out pre-installations of air conditioning in both new and old homes. In any type of home or business, we will design and install the ducts, all by air conditioning professionals. The pre-installation of air conditioning does not imply the purchase of the appliance. At APlus Group we will check your duct pre-installation, if you already have one installed, to see if everything is correct before installing your ducted air machine. In addition, if you do not have the pre-installation in your home, we will take care of designing, planning and installing it. In addition, we will place the necessary adjustable grilles or gates in each of the rooms of your home or business. The most widespread type of pre-installation consists of a network of air distribution ducts and a place for the subsequent installation of the air conditioning equipment, both inside the home or business and outside. In this type of installation, it is possible to incorporate a control system for temperature regulation of gates and thermostats. In APlus Group we carry out air conditioning, air conditioning and heating installations, with previous study and advice, we have a specialized technical service prepared to solve any incidence, we carry out an integral maintenance of your air conditioning and heating equipment to extend its life of use and a permanent service. Only a professional air-conditioning and air-conditioning equipment company can carry out an effective and efficient installation. Do not hesitate to contact us for advice. We are your air conditioning and air conditioning installers in Elche and Alicante of maximum confidence.